The Black kite (Milvus migrans – Boddaert 1783) is a bird of prey belonging to the order of the Accipitriforms (Accipitriformes), to the family of the Accipitrids (Accipitridae), to the subfamily Buteoninae, to the genus Milvus and to the species Milvus migrans. The epithet indicating the genus “milvus” comes from the Latin and means, rightly, kite, sparrowhawk, flying toy on string, and refers to its look as classical diurnal bird of prey. The term indicating the species “migrans” refers to the great migrations performed by this species which frequently has also erratic and itinerant behaviours. This species, but the American continent where is absent, is practically ubiquitous being one of the most diffused birds of prey in the world. It is greatly adaptable as it can live in many different habitats. It is present, with the different genetic variants, in Europe, Asia, Africa, Australia and several adjacent islands. Milvus migrans migrans (Boddaert 1783) distributed from north-western Africa to Eastern Europe to central Asia (Tien Shan) and, southwards, up to Pakistan; in winter it goes, in Africa, south of Sahara. Milvus migrans lineatus (J.E.Gray 1831) present from eastern Siberia from Amurland and in southern Japan up to northern India, from northern Burma and northern China to the Ryukyu Islands; in winter it migrates to southern Iraq and southern India and to south-eastern Asia. Milvus migrans formosanus (Nagamichi Kuroda 1920) present in southern China, Taiwan and Hainan. Milvus migrans govinda (Sykes 1832) present from Pakistan, through India and Sri Lanka up to Indochina and the Malaysian Peninsula. Milvus migrans affinis (Gould 1838) distributed in the Sulawesi islands and in the Lesser Sunda ones, eastwards in New Guinea and in New Britain up to Australia included. Finally, the Milvus migrans aegyptius (Gmelin 1788) present in Egypt, in south-western Arabia and on the African coasts up to Kenya and the Milvus migrans parasitus (Daudin 1800) present in Africa, south of Sahara, on the Cape Verde Islands, Comoro and in Madagascar, these two which were considered as other two subspecies of the Brown kite are now, seen the genetic differences, usually considered as separated species; or better, as two subspecies of a separated species, that is, respectively: Milvus aegyptius aegyptius and Milvus aegyptius parasitus. 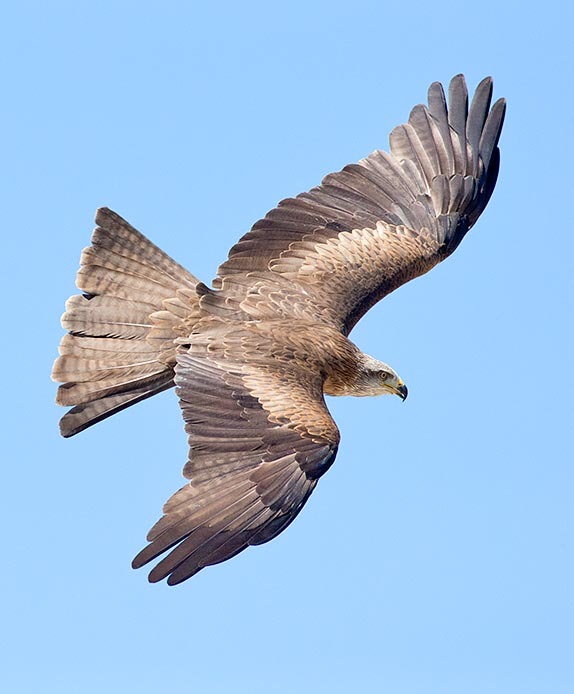 The Black kite lives in an extremely vast variety of habitats: from the semi-desert zones to the prairies and savannahs to the woods, even if it avoids the too thick forests. The wooded areas are particularly important for the nesting and for having suitable habitats where to perch. It is a great visitor to the aquatic habitats such as riverbeds and banks of rivers, lakes, humid-swampy zones, littorals and humid and wet meadows. This species is often linked to the human habitats as it frequents the urban outskirts even if much degraded, the harbours, villages, nomadic camps. It has colonized with a very great success very vast urban areas of Africa, of Asia and Karachi (the most populated city in Pakistan). Normally, it is a bird of lowlands, but it can get to feed and to reproduce up to 2000 metres of altitude. It has been sighted, occasionally, looking and getting food up to 4000 metres in the Himalaya. It is a gregarious species, at times they perch in community mainly on trees. 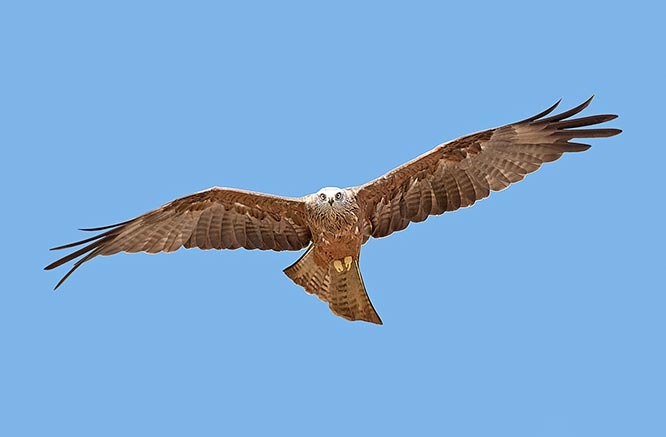 Cases of hybridization with the Red kite (Milvus milvus) have been reported on the Cape Verde islands. The Black kite is one of the most common birds of prey in the world, and is the most common in some regions; this is favoured by the adaptability of the species and by the man tolerance. Even if, due to the habitats it frequents, it is subjected to dangers related mainly to poisonings especially by pesticides and by chemical pollution of the waters. The species is declining in many parts of Europe, Russia and North Africa. This bird of prey is capable to colonize again the reclaimed areas. This elegant bird of prey is of medium size; it is about 55-60 cm long and has a weight varying from 560 to 950 g. The wingspan is of 130-155 cm. The colour of the livery and the size vary depending on the subspecies. It has a livery mostly brown-reddish, brown dorsally, slightly more reddish ventrally. The feathers, especially the upper and lower coverts of the wings and those of the chest and of the head, have centrally some dark-blackish lines creating short thin and thick streaks on the head and thicker, longer and sparser on the chest. The wing presents, below, a paler portion-patch at the level of the primary fight feathers (more or less pale depending on the subspecies), the tips of the wings (tips of the primary remiges) are dark (blackish). The head is shaded in pale greyish. The tail s brown and is slightly, but characteristically, bifurcate. The iris is greyish in the adult specimens, brownish in the juveniles and sub-adults; in the mature specimens the eyes are bright with yellowish hues. The cere and the gape are yellow, the beak, on the contrary, is black (the colour of the beak is greatly variable depending on the relevant subspecies). The legs are yellow with black claws. Sexes are similar. The young is paler and has more marked drawings and more contrasted reticulation. 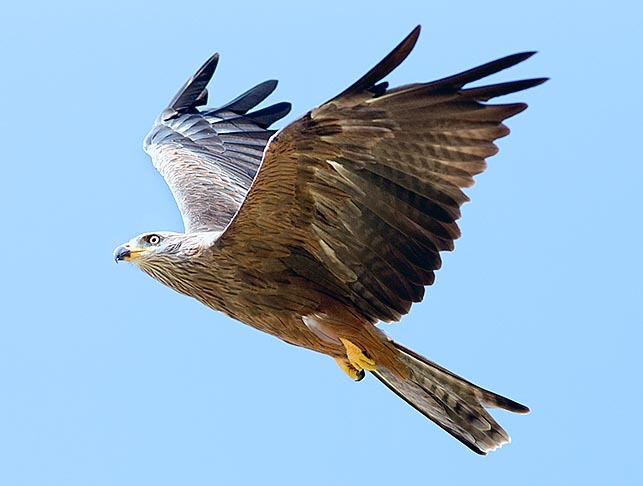 The Black kite distinguishes from the Red kite (Milvus milvus) due to the darker plumage, the slightly inferior size and the wings and the tail, proportionally, slightly shorter. 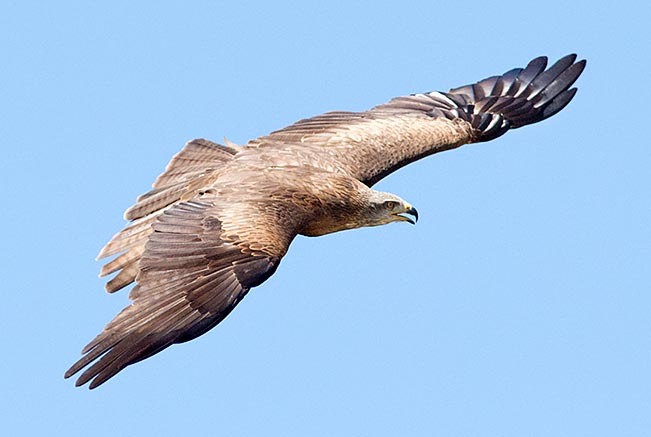 The Black kite, always comparing it to the Red kite, has wings with ample tips and slightly less forked tail, which is grey-brown and never reddish. It is a very adaptable species and in many parts of the world it has become table companion of the man. It nourishes of an ample variety of leftovers of animal origin: entrails from abattoirs, remnants of fishing, scraps, wastes, whatever type of carrion. It is also a predator of live animals: small mammals, voles and other small rodents, moles, young rabbits and hares, bats, small terrestrial as well as aquatic birds (often young), sometimes even of chicks of domestic fowls. It eats also fishes, lizards, amphibians and invertebrates such as grasshoppers, locusts, crickets, cockroaches, termites, flying ants, earthworms, crustaceans and molluscs. The fishes are often an important aliment for the diet of this bird of prey: normally found dead or dying, especially of small size. The invertebrates can be locally important or may have a seasonal importance. Unusually, it can nourish also of vegetal substances such as the fruits of the oil palms. It hunts the preys on the ground or in water; big insects are seized flying in the air. Often, it looks for food around the margins of water bodies, in the landfills, around the abattoirs or on the roads (collided animals). It goes scouring, flying up to 30 km far away from the perches where usually stays, with a slow, skilled and agile flight. It is an urban sweeper with unashamed character getting to take the food from markets, shops and trafficked roads. It is also capable to steal the food to other birds of prey or other birds. The reproductive season, due to the vast range, is very variable. N the temperate areas of Eurasia, it nests from March to June; in tropical Africa usually reproduces during the dry season, in South Africa in August-December; in Australia it is variable but reproduces mainly from July to November. The pairs reproduce in a solitary and isolated way as well as forming bland colonies which, in some cases, may count even some tens of pairs. Normally, the nest is built, at the level of branches or forks, on trees of various type (broad-leaves, conifers, palms); but also here the adaptation is high as they can utilize as sites for nesting also rocky protuberances, especially along the coasts, or palaces, buildings (in Egypt, India) or pylons. The nests or at least the nesting sites are reutilized during the following years. The nests are built with branches and vegetal material and can be covered with the most various materials such as: rags, plastic, paper, excrements, skins of animals. The brood is generally formed by 2-3 (1-4) eggs spawned at 1-2 days intervals. The eggs are generally white with few and sparse small roundish and “smeared” brown-reddish spots. The incubation lasts about 30-35 days and is done practically all the time by the female. The newborns, which come to life with the open eyes, are covered by a soft down of pale-caramel brown colour with darker zone around the eye. If the male takes sufficient food, the female can stay on the nest for a good part of the breeding of the chicks. Usually, the first flight takes place when about 42-50 days old, and the juveniles are cared, after that, for about 15-40 days more. Although there may be bred more young per each brood, the average of the young carried to the flight stands around one only young (0,9-1,2) per pair. This also due to the fact there is often a great competition among the brothers of brood with the strongest one/ones that assail the weakest brothers until they succumb. They can be reproductive, at times, already by the first year of life. 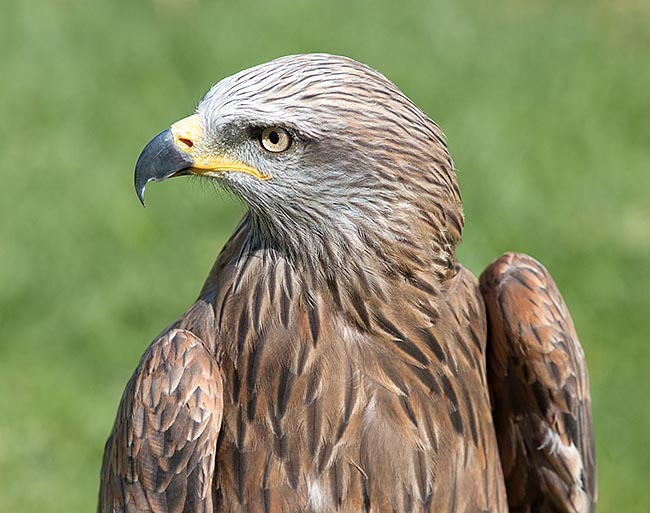 The Black kite can live up to 20 years (one specimen is reported as having lived 23 years). This species, as the name says, is mainly migratory and shows nomadic and dispersive tendencies after the reproductive period that, as we already said before, varies depending on the geographic area. The nominal subspecies, Milvus migrans migrans, is migratory, but only partially (in China and in Japan is partially resident). The subspecies Milvus migrans lineatus is migratory, but only partially (in China and in Japan is partially resident). The subspecies Milvus migrans govinda moves for avoiding the monsoons and based on the trophic availabilities. The other subspecies, and the kindred African species, show movements connected to the rain season and very variable with resident populations; others accomplish important migrations; some manifest wandering movements and others have movements still little known.